Muramba movie songs music is composed by happening music directors from Marathi film industry who has served marathi song loving audience with variety of genre from calm soothing composed to rock, this time also with "Muramba" movie song they had not disappointed there audience. 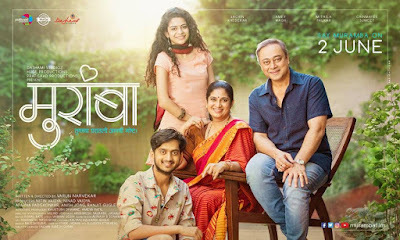 There are four song in movie album starting with title song of Muramba which is indie-pop like song sung by leading actress of the movie "Mithila Palkar" and "Jasraj" himself. The second song "Chuktay" from the movie is sung by lead actor "Amey Wagh" which is rock and little bit of classical element in it. The third song "Majhe Tujhe" is a gazal which really treat to ears sung by "Anuradha Kuber" it is beautiful song picturised on Sachin Khedekar and Chinmayee Sumeet lyrics of these threee song is written by lyricist "Vaibhav Joshi". The fourth song "Aga Aik Na" is a peppy song whose lyrics is written by "Jitendra Joshi" and vocals for the song is given by "Rohit Raut" and "Aanandi Joshi". Altogether it is nice album and while "Majhe Tujhe" and "Aga Aik Na" will be loved by most of them.